We have all been patiently waiting for the All-New Jeep Wrangler, and it is finally here! There isn't an inch of this SUV that hasn't been upgraded including interior and exterior enhancements, multiple aggressive drivetrain options, and 4WD systems! There is nowhere this Jeep can't go because it is more capable than ever before! Take a look at the rest of our 2018 All-New Jeep Wrangler review for more info about this sweet SUV! What kind of trim options does the 2018 All-New Jeep Wrangler offer? Jeep made incredible exterior and interior enhancements to the All-New Wrangler while staying true to the iconic Wrangler image. Each all-new 2018 model retains many of the signature features like the seven-slot grille, pronounced trapezoidal fender flares, and round headlights! Plus the aerodynamics have been enhanced with slight changes to the windshield and grille angle. Jeep is offering the two-door Wrangler in three trim levels: Sport, Sport, and Rubicon. The Sport model comes loaded with great features like a 12-volt power outlet, floor console, 17" black steel wheels, cargo tie down loops, illuminated cup holders, a rear folding seat, steering wheel mounted audio controls, Bluetooth integrated voice commands, and an audio jack. As well as a 5" touchscreen with Uconnect 3 and an 8 speaker sound system! The Rubicon builds on the Sport with features like a 7" touchscreen with the Uconnect 4 system, ambient interior lighting, LED headlamps, rock rails, Apple CarPlay/Android Auto, and red tow hooks! What type of drivetrain is offered for the All-New Wrangler? 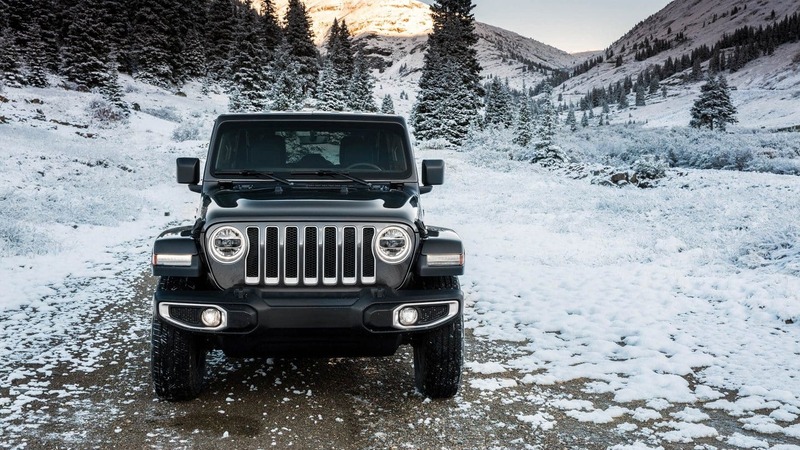 Each All-New Wrangler is powered by the same 3.6-liter Pentastar V6 engine with VVT that generates 285 horsepower and 260 pound-feet of torque. The standard transmission match for this engine is a six-speed manual but you can opt for an eight-speed automatic on all trim levels! The All-New Wrangler is pretty efficient too! The EPA estimates that this engine can get 17 miles to the gallon in town and 23 mpg on the highway! There are few different 4WD systems offered. The Command-Trac part time 4WD system comes with the Sport and Sport S models. The 4:1 Rock Trac HD part time 4WD system comes on all Rubicon models. If you've got some extra gear to tow it's no problem for the All-New Wrangler because when properly equipped this SUV can tow up to 2,000 pounds! When it comes to off-roading each All-New Wrangler is capable of up to 30 inches of water fording and features industry-leading departure, clearance, and breakover angles! What type of safety and security features are available for the All-New Wrangler? Safety is important to every driver and passenger but especially when off-roading and that is why Jeep has loaded each All-New Wrangler with tons of great safety and security feature! Standard safety and security features for all trim levels include hill start assist, a rear backup camera, a seat belt alert, hydraulic assist brake booster, and electronic stability control, and multistage front airbags. There are also quite a few optional safety features such as trailer sway damping, a remote start system (automatic transmission only), a security alarm, tire pressure monitoring, front seat side airbags, remote keyless entry and a Sentry Key theft deterrent system! Jeep has created the best Wrangler yet for 2018! We love everything about this All-New Wrangler, especially all its incredible capabilities! Come on down to Foss Motors today to learn more about this all-new and amazing SUV! We can't wait to work with you!